Sunny Lemon Cake Recipe - Recipe from "Piece of Cake!" This recipe for Sunny Lemon Cake is adapted from "Piece of Cake: One-Bowl, No-Fuss, From-Scratch Cakes" by Camilla V. Saulsbury (Robert Rose Inc., 2011). She bakes two layers and uses a Fresh Lemon Frosting to fill AND ice the cake, but I bake three layers and use my Fresh Lemon Mousse recipe for the filling and 3/4 batch of her Fresh Lemon Frosting for the top and sides. But, then, that's why Saulsbury's recipe is an excellent no-fuss cake. Make it her way or my way. The results are both stunning! Lemon cake is a universal favorite. In Polish, this would be known as ciasto cytrynowe, Russians and Ukrainians would call it limonnyĭ tort with a slight spelling variation, Serbs, Croatians, Slovenians and Bulgarians would say limun tortu with slight spelling variations, Hungarians call it citromos sütemény, Lithuanians call it citrinų pyragas, Romanians say tort de lamaie, and Czechs and Slovaks call it citrón koláč. This is such a pretty cake, it will bring a ray of sunshine to even the gloomiest of days. Note: If using a stand mixer, decrease the high-speed beating time in step 2, below, by 1 minute. Heat oven to 350 degrees. Grease and flour two or three (9-inch) round cake pans, depending on how many layers you would like to make. In a large bowl, whisk together flour, sugar, baking powder, and salt. Add eggs, buttermilk, butter, margarine, lemon zest and lemon juice to flour mixture. Using an electric mixer on medium-low speed, beat for 1 minute until blended. Scrape sides and bottom of the bowl with a spatula. If using a hand-held mixer, beat on high speed for 2 minutes. If using a stand mixer, beat on high for 1 minute. Add lemon-lime soda and vanilla. Beat on low speed for 15 to 30 seconds, until just blended. Spread batter evenly into prepared pans, dividing equally. Bake for 25 to 30 minutes (less time for three layers) or until a toothpick inserted in the center comes out with a few moist crumbs attached. Let cool in pans on a wire rack for 10 minutes. Run a knife around edge of pans, then invert cakes onto rack to cool completely. To make the Fresh Lemon Frosting to fill AND ice the cake, in a large bowl using an electric mixer on high speed, beat the cream cheese and butter until light and fluffy. Gradually add confectioners' sugar, beating on low speed until blended. Scrape down the bowl with a spatula. Add lemon zest and lemon juice. Beat on high speed for 1 to 2 minutes or until fluffy. Cover and refrierate for 30 to 45 minutes or until firm enough to spread. To make the Fresh Lemon Mousse to fill the cake, make only 3/4 of the Fresh Lemon Frosting recipe to ice the top and sides of cake, and make the lemon mousse as follows. In a small bowl, combine lemon juice and 1 cup cold water. Sprinkle gelatin on top and let sit until softened, 2 minutes. Fill a medium bowl with ice water. In a small saucepan, combine gelatin mixture, sugar, and a pinch of salt over medium heat and stir until gelatin and sugar dissolve, about 4 minutes. Pour gelatin mixture back into a small bowl and set the bowl in an ice bath. Stir until mixture reaches room temperature, about 1 minute. In a large bowl, whisk cream until soft peaks form. Pour cooled gelatin mixture into whipped cream and whisk until soft peaks return. Refrigerate 10 minutes and then divide evenly over tops of two layers of cake. Refrigerate until mousse sets before frosting. 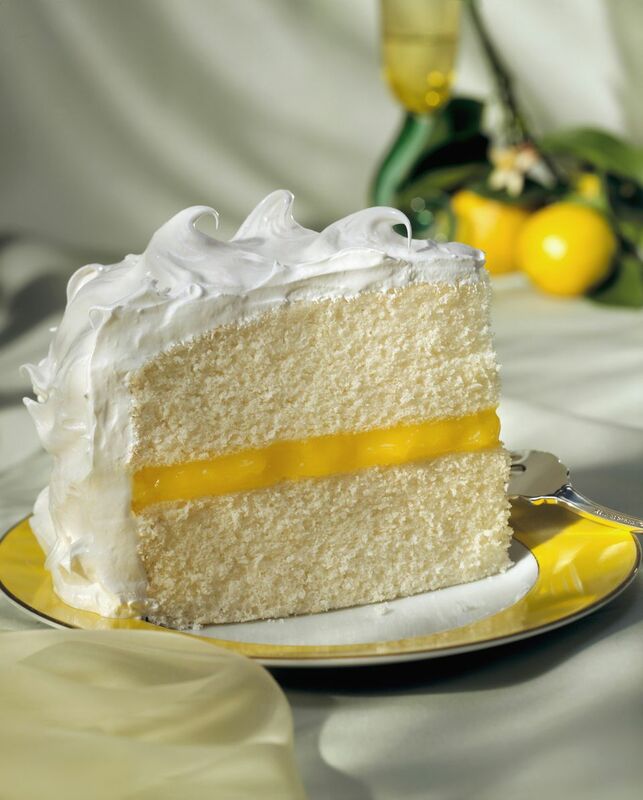 Note: If using Fresh Lemon Frosting, place one cake layer, flat side up, on a cake plate or platter. Spread 3⁄4 cup (175 ml) of the frosting evenly over bottom layer. Top with the second cake layer, flat side down. Spread the remaining frosting over top and sides of cake. Refrigerate for 1 hour before serving. Note: If using Fresh Lemon Mousse for filling, place one cake layer, flat side up on a cake plate or platter. Spread half the mousse over bottom layer. Top with second cake layer, flat side down, and spread with remaining mousse. Top with the third cake layer, flat side up. Spread lemon cream cheese frosting over top and sides of cake. Refrigerate for 1 hour before serving. Storage tips: Store the frosted cake in the refrigerator in a cake keeper, or loosely wrapped in foil or waxed paper, for up to 3 days. Alternatively, wrap the cooled, unfrosted cake layers individually in plastic wrap, then foil, and freeze for up to 6 months. Let cake layers thaw at room temperature for 2 to 3 hours before frosting and serving.